Lysander Venible, author of On Your Own In Tax Court, will be available to answer your questions about any IRS administrative or Tax Court issue you have. Tax Law, Tax Court, Non-Filers, Collections, Liens, Levies, Penalties , Hearings, Audits, Notices, Refunds, you name it. Lysander has spent more than a decade studying and working with the IRS and the U.S. Tax Court. He does so on a daily basis. He has learned a lot about administrative procedures and how to conduct both administrative and court cases with the IRS. He can save you a lot of time and potentially a lot of money and headaches in dealing with the Service. Bring your questions about your current IRS problems or just join us to tell us about your experiences with everyone’s favorite government agency. 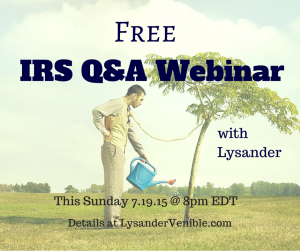 The IRS Q&A webinar is this Sunday night from 8pm to 9pm EDT online. Send me an email* with your question or remarks. If you don’t have a question and just want to listen in, that’s fine, too! Just send an email with a little bit about your situation or your interest in IRS topics. We’ll reply with a link to join the webinar from your computer, tablet or smartphone. You’ll also get a US phone number if you want to call in. PLEASE NOTE: This is NOT a discussion of patriot or conspiracy theories. Not that some of them aren’t perfectly valid. On Sunday night, we will focus on your questions about your current IRS problems and how you might most effectively address them. The goal is to keep your principles and stay out of trouble. Talk with you Sunday! *This email address is encryption ready. Let’s exchange keys, then our emails are private. Click here for my public key.